On Tuesday, Avon High School and Massillon squared off in a practice/scrimmage. Bill Greene from Scout.com was there and came away very impressed with current Michigan commit Andrew David’s playing ability. Andrew David slams a 47 yard FG against the wind. Good by plenty. #Michigan. "I am kicking the ball off the ground college-style and made every ball except for one from 57 yards that missed left. I had 7 kicks and made six of them. I also had six punts including one that was in the air for over five seconds that went 56 yards in the air from the line of scrimmage. I thought overall it was a solid day for me to begin the season." Once Andrew arrives in Ann Arbor, look for him to win the placekicker position right off the bat; he’s that good. 2015 DE target Darian Roseboro is scheduled to make his college decision on August 29th. 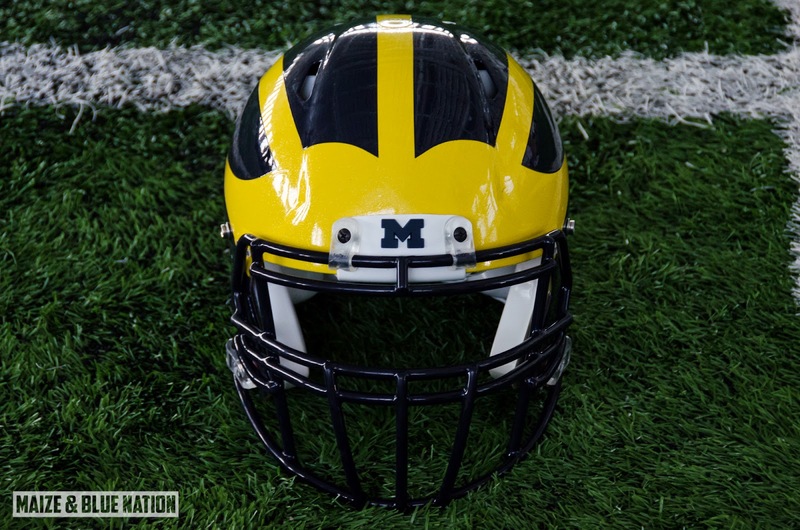 As of right now, I fully expect Darian to become the next member of Michigan’s 2015 recruiting class. Last week ESPN’s Gerry Hamilton went to Lincolnton High School to view a practice first hand. Heck, he may even be able to play running back in some goal-line situations. Those are some very impressive vines if you ask me. Roseboro will likely choose between Michigan and North Carolina State when he makes his decision. Darian is currently ranked as the #6 SDE, and #157 overall across the nation according to 24/7 sports. He also holds a crystal ball that reads 72% Michigan, 22% North Carolina State, and 6% North Carolina. Earlier this week, 24/7 sports released their early 2017 player rankings. Out of the 103 players included on this list, six of them hold scholarship offers from Michigan. 2016 LB and current USC Trojan commit Daelin Hayes will be transferring to St. Bonaventure High School in Ventura, California. In my opinion, this ends any chance that Michigan had to flip his commitment. 2015 Florida State RB commit Johnny Frasier has told multiple sources that he will make the trip to Ann Arbor before his recruitment is done. Although Michigan already has a running back for 2015, in Mike Weber, it’s highly unlikely they would take a second running back due to the amount of scholarships available for 2015. 2015 LB Osa Masina’s mother spoke with 24/7’s Barton Simmons earlier this week about potential visits for the 4 star linebacker. Possible visits for Michigan include the Utah and Penn State games. If he’s unable to make it to either, Masina will likely have to visit in the off-season.